Our next offering in the 2017 PopCult Gift Guide is a CD/DVD combo that came out eleven years ago. 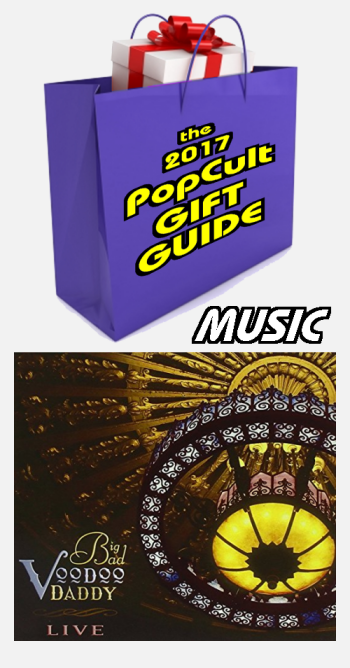 I didn’t get it until this year, and it’s still great, and not too pricey, so I’m including it in the gift guide. After 10 years & 1400 shows, BIG BAD VOODOO DADDY LIVE was the band’s first ever live concert CD/DVD. This package features 16 BBVD favorites (and one extra on video),plus cool bonus features. This is a retro-Swing goldmine. Lead singer, Scotty Morris, is in fine voice, and the band is red-hot. The tunes (mostly originals, with a few Swing standards sprinkled in) are fantastic slabs of hot swing, designed to make you dance and twirl and maybe bang your head on stuff if you aren’t careful. The sound quality is top-flight and the video work is a blast. The DVD was filmed using just two hand-held cameras and a camera on a crane for over-the-crowd shots. The spirit of the band shines through, lighting up the stage with their sheer excitment and musical mastery. The DVD bonus is a short film done by a member of the group about how the group was formed. It gives an intimate portrait of the band’s early years. This band lit up one of the last Sternwheel Regattas, and it’d be fantastic to see them turn up in Charleston again sometime soon (Are you listening, Clay Center?). Big Bad Voodoo Daddy was one of the pioneer Swing Revival bands of the 90s, and they’re still going strong. This is the perfect gift for any Swing music afficianado on your gift list, or just anybody who likes great live music in general. If you have a die-hard BBVD fan on your shopping list, they may not know that the band released a brand-new album early last summer. Louie! Louie! Louie! is a terrific celebration of jazz legends Louie Armstrong, Louie Jordan and Louie Prima. Produced by founder and lead singer Scotty Morris, the album is a stunning tribute to three guys named “Louie” who changed the face of American music. On their eleventh album (their third for iconic label Savoy Jazz) the band is sharper than ever as they pay homage to their jazz heroes. 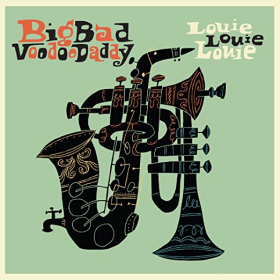 You ought to be able to order both the live CD/DVD and the new album from any record store, or head on over to Amazon for BIG BAD VOODOO DADDY LIVE and Louie! Louie! Louie! Tell ’em the guy who hosts The Swing Shift sent you. Then explain to ’em that The Swing Shift is the Swing Music show hosted by your PopCulteer that can be heard Tuesdays at 3 PM and all night long Sundays and Thursdays at Midnight on The AIR. You might also have to explain what The AIR is.